Carnitas taco, topped with avocado slices and pico de gallo. Made in the Adventure Kitchen in June, 2015. 1. Cut the pork shoulder into strips about 2 inches wide. 2. Lay the strips in a large pot and sprinkle the salt all over them. Add enough cold water to barely cover the meat. 3. Set the pot over high heat with the lid askew, just until it begins to boil. Stay close - as soon as it begins to boil, remove the lid (otherwise, it will boil over). 4. Let the carnitas boil on high heat for about 1 - 1 1/2 hours, using tongs every once in awhile to turn and redistribute the meat in the pot. As the time passes, the water level will gradually go down as it evaporates. 5. After about 1 - 1 1/2 hours, listen for a change in the sound of the carnitas as it cooks. Instead of boiling water, you will hear frying and sizzling, which is a clue that all the water has evaporated. What looks like liquid still in the bottom of the pot at this stage is mostly just the rich, delicious fat that has melted off of the meat. 6. Turn the heat to medium and begin turning the meat with the tongs to brown it in the fat. 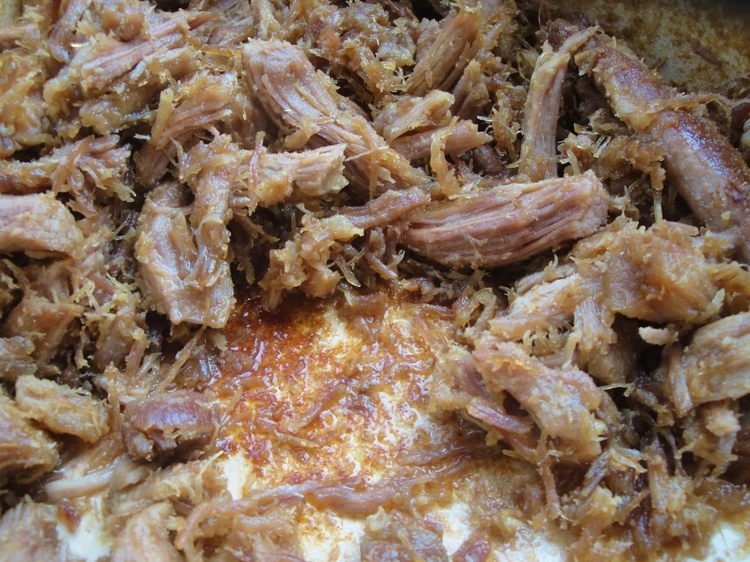 Brown bits will begin to form on the bottom of the pot as the carnitas continues to fry. Adjust the heat as needed to make sure the brown bits don't burn and the fat doesn't smoke. After about 8 minutes, you'll need to turn the heat to medium-low to continue turning and browning the meat without burning or smoking, until it is golden brown on all sides. It will likely begin to fall apart and shred a bit at this stage, which is fine. 7. 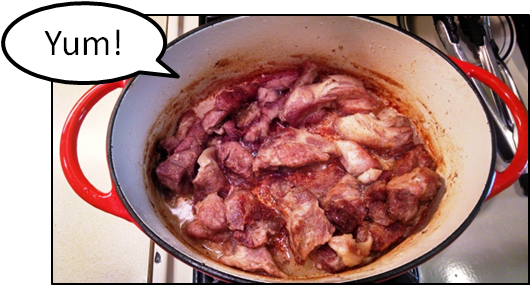 Turn off the heat and use tongs to transfer the carnitas into a bowl. If there is still liquid fat standing in the bottom of the pot, discard it. 8. Use your fingers or forks to begin breaking the larger chunks of meat apart (I think fingers are easiest). A partially shredded, partially chunky mixture is perfect for tacos. If you find any large chunks of fat remaining in the meat, you can discard them, or break them up into smaller pieces and leave them in (depending on how you think your guests will react). If you need a primer on heating and handling tortillas (to keep them from tearing, shredding, or just not being delicious), read the Tortilla Technique section of this post for a complete how-to, including options if you don't have a tortilla warmer.